KSM: The message from the scriptures is that everything is so sacred! GS: You become sacred and these feelings give you confidence, strength, vitality, and vibrancy. All kinds of good qualities come to you because you are spiritually so charged. Don't be a wicked person. When you are a wicked person, the whole of nature doesn't want to have anything to do with you; it wants to get rid of you; that should not be the case. When you are here, your presence should be pleasant for even birds and beasts; everybody including you should enjoy your presence; that is the way it should happen. GS: That meant He was in a mood to give us wisdom. We were only half a dozen teachers. He asked us, “I have a question for you. Why is it that silk saris are becoming very very expensive in modern times?” We knew that when there was a question, it was going to be a tough time for us and it was better to keep quiet. Swami said, “You are all professors. So you must answer.” Even then we kept quiet. Then Swami said a wonderful thing – the spiritual significance of why prices shoot up. It is spiritual, not economics; you can call it spiritual economics. Swami said, “There is a logic in what is happening in this entire universe. It is spiritual logic which you don't see because you don't apply your spiritual mind. If you apply your spiritual mind, you will find that when all human beings run after something, automatically its price shoots up. When all human beings stop running after it, however valuable it is, its value will crash immediately.” He gave an example – “You run after silk saris and you want to have them at any cost; because your desire to have it is so intense, its price shoots up.” At a deeper level, the demand is a manifestation of a desire. GS: That's all. You want to buy it at any cost; that fellow will charge say Rs. 10,000 and you are ready to buy. If he says 15,000, you will pay it because you want it. It is the intensity of your desire. When he says 15,000 and your desire dies and you think, “Let me kill my desire” you will not want it even if the shopkeeper says, “I will give it to you free”. Swami said, “I materialise lot of things including gold and give you. They are valuable because of the gold and because I am giving you value them and you are very very happy. But the same gold has no value for me and I throw it away just like that. Tomorrow if you bring a diamond and give, I won't have any desire for it.” A sanyasi has no value for anything in the entire world. All your economics crashes in one shot when you kill your desires. You give me an AC room; I don't want it; I am very happy on the road. What you will do? DA: Very true. In fact Swami has lived as such an example. GS: Yeah, why don't we understand it? He was living a very simple life to tell us about it. Even today the ashram people live in one room. Highly accomplished people in the world would like to come and settle here after retirement. They are very rich people. DA: Simple living and high thinking! KSM: This includes our Vice-Chancellors and members of the Central Trust, which most people don't realize. GS: Why is it happening in Prasanthi Nilayam or Ramana Maharshi Ashram or for that matter Aurobindo's Ashram? Wherever they go, they lead a simple life with simple things. They are highly successful people, brilliant people who have accomplished everything in the world. When they are doing it, why don't you think you can also do it? DA: I think the orientation changes once we realize the real purpose of our lives. We have to think like Alexander and Napoleon and all the great kings; when they went away from this world, they could not even take a handful of dust. So if one realizes the real purpose of why we are born or the goal of our lives, the orientation absolutely changes. But the mind comes in the middle of what we think we are and the reality of our lives and the real goal of our life, which is spiritual realization. The mind is necessary for us to live in this world. Without the mind we cannot live. Without the eyes, ears and tongue, it is difficult to exist. 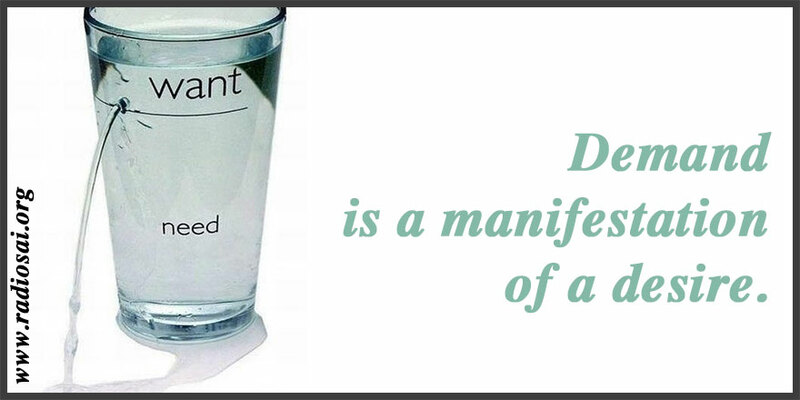 The mind has the habit of dividing and desiring everything. The love that God gave us in the beginning of time, the mind divides into so many small pieces. It goes into people, gadgets, power, money, positions, and relations. It divides into so many small fragments and pieces that it doesn't remain the original love anymore. The problem is that we don't think about the real purpose of our lives and we borrow our desires from everywhere. KSM: Or we borrow this picture of what a perfect life should look like from the media. From some manmade social norms. For example, the joke is if you live in North America you have to have a cookie cutter home in the suburbs, couple of kids, a big dog, a van and another SUV. These are the standard parameters we have set for ourselves and we are always trying to compete and compare ourselves to others. DA: Right, that is the problem. KSM: We get caught up in that web we create for ourselves. I will give you an example. Swami was very particular that we get a salary which is good for normal living and not a huge salary for one reason that when so much of money is available, there is a possibility of the person going mad. Today software engineers in the world with very huge salaries at a young age do not know what to do with that money. KSM: And for that matter, many celebrities, especially young celebrities. We have so many case studies where they have come into enormous wealth very quickly; they very quickly hit the end of the road and ended up in rehab. KSM: Would you like to elaborate on it? DA: Oh very much! In fact I would like to start with one particular instance when the CEO of an organization came and addressed the MBA boys. 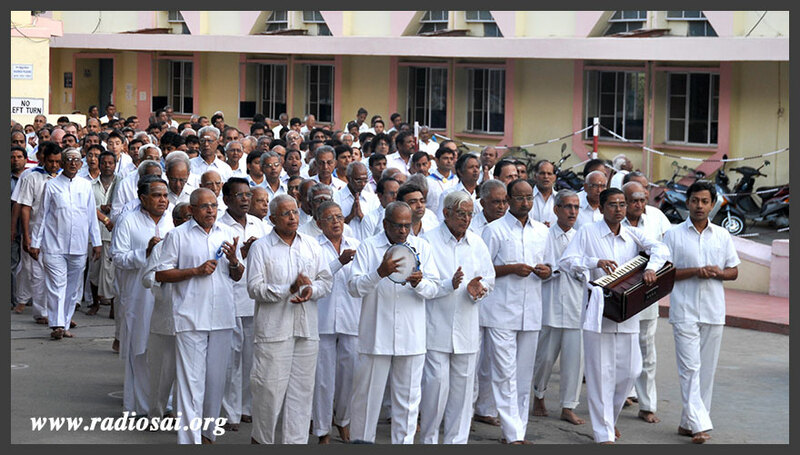 He heard about the integral system of education where they chant Vedas and go for spiritual practices such as Omkaram and Suprabhatam in the morning. When he heard about this whole system, he was slightly confused. DA: There has to be a harmony. We talked about the mind going in different directions. KSM: Makes it sound so simple. DA: When your mind is focused on God, Swami says your other desires will automatically fall away. Your priorities will take a huge turn; that is how Swami trains the mind. We spoke about the animals of the forest and how they follow discipline and rules. One very interesting instance comes to my mind just now. It was shared by Mr. Sanjay Sahani, the Director of the Brindavan campus of the institution. We were in Badrinath two months back during the holidays and we had a satsang. One day he shared this about a person who was privileged to walk behind Swami in the earlier times in Brindavan. There was no hall but only trees; there were some mango trees in the campus. One day as he was walking behind Bhagawan, Swami passed by a mango tree and on the tree were a bunch of monkeys. Swami told this person, “Go to Rajmata's residence and bring some peanuts.” He quickly ran as he knew where the peanuts were in the kitchen; he brought those peanuts and gave them to Bhagawan. Bhagawan put a fistful of peanuts on His open palm. He looked at the monkeys and just indicated by His eyes for them to come and partake. This individual was totally aghast, flabbergasted, and amazed that all the monkeys came down one by one and formed a perfect queue in front of Bhagawan, better than what the boys make in the mandir. They came in line and took a peanut each. We spoke about monkeys grabbing peanuts. No! 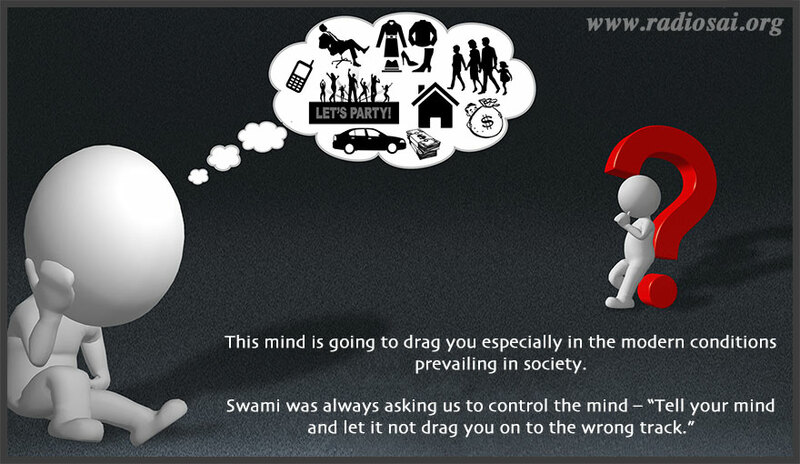 We have here the Parameshti who can control Prakriti – even the monkey mind which cannot be controlled. KSM: And I am sure those monkeys would have been highly offended if they heard us describe our fickle minds as 'monkey minds', because they proved that monkeys can be so disciplined. DA: Perhaps, they talk about the human mind as the example of unsteadiness! GS: Now talking about ceiling on desires, as I mentioned, Swami wanted people not to desire lots of money, which is likely to create problems. It has been evidenced recently in Bangalore when software engineers began to earn very huge salaries and suddenly because of lay-offs they were almost on the roads with a lot of debt. If you can't pay the EMI, you have to sell whatever you acquire for any price and you get into deep trouble. If you begin to lead a simple life, love to lead such a life and you are happy, all problems are solved. I was thinking two-three days back about my teachers who taught me when I was in school. My Sanskrit, Telugu and Hindi teachers in those days were getting at the most a thousand rupees or so. They were very happy with their wife and children and they aspired for their children to be teachers in schools. Being a school teacher, they were not very inclined to make their sons an engineer or a doctor or something beyond his competence. Today the problem is that desires are beyond our competence and everybody is rushing. That is the reason why Bhagawan Baba said that it is parents who are actually poisoning the mind of the youngsters to a very large extent. All parents should stop thinking on those lines and should try to give them a good life and make them good beings. KSM: High earners at any cost. GS: That is what we are doing. We send them to corporate schools. There is lot of pressure on them and they are not able to take that pressure. You should know whether the child can take so much of pressure or not. You are pressurizing them. It is like packing Puttaparthi, which is a small village, with a lakh of cars. KSM: God forbid! I hope that day never comes. What do you think about this article? Please let us know by writing in to [email protected]. Do not forget to mention your name and country.